This expansive estate, once belonging to U.S. President, George Washington, rests on 500 acres and boasts spectacular views of the Potomac River. A small portion of the mansion was originally built by Washington’s father in 1735 and was later transformed into the 21-room mansion we know today as Mount Vernon. 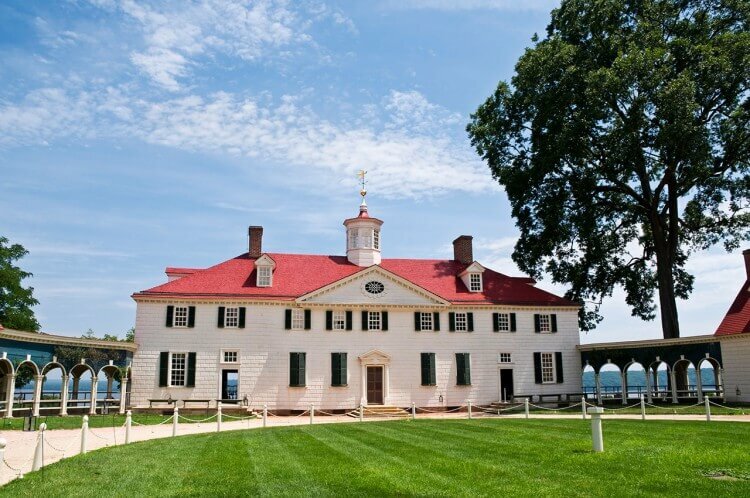 The estate has been restored and preserved to reflect Washington’s original design and décor. The entire Mount Vernon property is open to the public, so be sure to set aside an entire day when visiting. Tour the mansion for a first-hand look into the life of George Washington followed by a stroll along the mansion’s outbuildings. These outbuildings housed essential operations such as laundry, meat curing, and more. Wander through one (or all) of the four lush gardens spread across the property. See where George, Martha, and other members of the Washington family are laid to rest at The Washingtons’ tomb. And when you’re ready for a thorough history lesson of one of our Founding Fathers, take a walk around the Donald W. Reynolds Museum and Education Center located on the property. The estate also offers activities for kids, such as live demonstrations and a visit with the many animals bred on the plantation. Originally built in 1731, “Peacefield” once housed four generations of the Adams family, including President John Adams and President John Quincy Adams. Today, this stunning Georgian-style estate belongs to the National Park Service but remains intact from the occupancy of the last generation of the Adams family in 1927, including much of the original décor and furniture. See the breath-taking, two-and-a-half story estate for yourself by visiting the Adams National Historical Park in Quincy, Massachusetts—just 10 miles outside of Boston. A full park tour will cost you just $10 (free if you’re under the age of 16) and lasts three hours. Sneak a peek into the historical lives of the Adams family with a short film; jump on a trolley to visit the birthplaces of both former Presidents; and experience the Old House first-hand with a guided tour. The trolley ride offers views of acres and acres of orchards and 18th-century gardens, so be sure to grab a window seat! Monticello, the monumental estate built and owned by President Thomas Jefferson, is renowned for its unique architecture and beauty atop an 850- foot summit in the Southwest Mountains of Virginia. Jefferson’s love for Italian neoclassical design is showcased through Monticello’s exterior, which is notably unique then compared to the homes of other Founding Fathers. Deeply fascinated by various styles of architecture, Jefferson also incorporated popular design elements from the 18th century—and from his own imagination—into the home’s overall design. Although a depiction of the home is imprinted on the backside on the U.S. nickel, Monticello should be experienced first-hand. Plan a day trip to soak up the beauty and history of this presidential estate. Visitors can take a tour through the first floor of the two-story home (and second floor if you upgrade), offering a glimpse into the life and ideals of one of our nation’s forefathers. Stroll through Mulberry Row, the string of outbuildings that housed the plantation’s specialized functions. Wander the gardens where Jefferson spent much of his time experimenting with agriculture and botany. There are also several museum galleries and a theater for additional teachings on Jefferson’s life. Just outside of Nashville lies Andrew Jackson’s famous Hermitage plantation, which was occupied by “The People’s President” from 1804 to 1845. During that time the mansion underwent several renovations resulting in the Greek Rival architecture you see today. While the elegant five bay, two-story exterior is a sight to see all on its own, the interior of the home is outfitted with extravagant design details, including carved marble mantels, classical-style doors and windows, hand-painted wall paper, and a sizable circular staircase. For about $20 (more for upgraded packages) you are free to roam the 1,000 acres of land, plus tour the mansion’s interior, surrounding outbuildings, gardens, exhibit galleries, and more. While Ulysses S. Grant lived in many homes during his lifetime, his Galena, IL home was one with great significance. Grant originally moved to Illinois to help his brothers run the family store, but his destiny changed abruptly when he left for the Civil War. Upon returning home as a Civil War Hero, Grant graciously accepted a new and beautifully designed home from the residents of Galena. Today you can visit the brick, Italianate-style home for a glimpse into the life of the 18th President of the United States. Tours are given by interpreters in period costumes who provide insight to his life during the Civil War and through his presidency. Original furnishings remain inside the home and are preserved by the Illinois Historic Preservation Agency. Be sure to set aside at least a half-hour for a tour, which costs you just $5 per adult.